I’ve recently been enjoying some (possibly) healthy, irreverent debate with colleagues at Blackboard and beyond about some of the differences between such proprietary regimes and the open-source community of Sakai. While the Twitter channel we’ve been using generates plenty of pithy ripostes, at times a tweet calls out for more sustained thought and response. A recent tweet from @georgekroner—one of my favorite Blackboarders—set me thinking and led to some longer—if not deeper—reflections, likely to be far less entertaining than the short salvos in our ongoing snarkument on Twitter. The tweet that set me off was George sharing his concern that Sakai 3’s planned capabilities might be “commonplace” by the time it is ready for widespread use. I’m not entirely convinced George’s concern is for real, given that Sakai is one of the most significant challenges to Blackboard’s market dominance in learning technologies and it would seem any failure on Sakai’s part would be cause for celebration rather concern over at Blackboard. But maybe George is just the kind of guy who wishes the best for everyone. Or maybe it’s part of Blackboard’s continued posture that having a near monopoly in the proprietary market is fine as long as there is at least one viable open-source alternative like Sakai, even while Blackboard itself acts like open source can’t really compete. But I’m not inspired here just to wipe away Blackboard’s crocodile tears. George’s tweet started me thinking: if he is right, and the kind of experience Sakai 3 will offer becomes commonplace, we should all celebrate rather than wring our hands. If Sakai 3 ends up fitting within the broader scope of contemporary online experience, that means Sakai 3’s open, social, user-centered, integrative paradigm shares in broader understandings of what online experience should be—both within education and beyond. It wouldn’t just mean Sakai 3 “guessed right,” it would also mean a very healthy, widespread vision of what the web can and should be has won out. Far from a concern, I would count Sakai 3’s capabilities becoming “commonplace” as a major success, not only for Sakai, but for the web in general. The question I asked myself after reading George’s list is whether the widespread use of any of these tools (or others like them) would really make Sakai—or other integrated learning platforms—obsolete or unnecessary or uninteresting—in other words, “commonplace.” I and others have taken up this point before and in the end, I still land in the same place. I think educational institutions will want and need to supply a local platform that enables things like a common user experience, integration, authentication, identity management, and more. I would assume Blackboard also holds this view. At the same time, I agree with George’s thinking (but not his concern) that the best of these local platforms will follow Sakai 3’s model, and often integrate other tools, enable collaboration and social networking, open their APIs, be delivered via devices not yet invented, and so on. Last but not least, I still think the educational community itself is the best engine for the development of the tools specific to its core mission, like teaching, learning, and research. In the first category from George’s list, Google’s Sidewiki stands alone as an example of what we might call an independent, “web 2.0” tool that provides some specific functionality that might be used in conjunction with a variety of other tools. There are way too many great examples of such tools to list here, from social bookmarking tools like Delicious to web conferencing tools like DimDim. I don’t think any of these tools alone could stand in for a full learning platform, but any might be used to extend a learning platform, or be cobbled together with a number of complementary tools to approximate an integrated learning platform (earlier, I attempted an instructive, but ultimately unsatisfying, experiment of this nature using Ning at EDU Next). Sakai 3 will provide the perfect platform to integrate these kinds of tools, from user treats like Sidewiki all the way down the stack to important glue like Apache Jackrabbit. The community designing Sakai 3 is highly conscious of where the boundaries should be drawn: where Sakai should provide native functionality, where it should leverage already existing tools, and where it should leave things open for integration (ie, pretty much everywhere). The second category in George’s list includes Atlassian’s Confluence wiki and Jive’s social business suite (headquartered right here in our own PDX!). Both are examples of more fulsome systems designed primarily for business that one might see as approximating the capabilities of a learning platform (along with similar examples like Microsoft Sharepoint). Yet one crucial difference separates these business systems from learning platforms like Sakai, Moodle, Desire2Learn, a host of others, and—one would hope, Blackboard itself: namely, none of these systems is designed primarily for education. One could argue (and I would agree) that education is a lifelong process and that all these systems are tending toward worthy common practices to support it that incorporate capabilities such as user-centered experience, collaboration, integrative mash-ups, and social networking. However in the Sakai community, we believe strongly that our work benefits from our clear, primary focus on education. It may be that from Blackboard’s proprietary, corporate viewpoint, it is harder to tell the difference between their products and these systems designed primarily for business use. We don’t have that concern about our work within Sakai. The last category in George’s examples is represented by OpenSocial. Not just a tool or platform, OpenSocial represents a more general technology, standard or protocol which any or all of the other examples above might incorporate. We expect to see Sakai 3 integrate OpenSocial along with other such standards and protocols that make sense, just as we have seen in Sakai 2. Examples would include other parts of the open stack (eg, OpenID, OAuth, PoCo, etc), JSR, IMS, and others too. The existence of something like OpenSocial doesn’t obviate the value of an integrated, open source learning platform like Sakai, built by education, for education, any more than it suggests the obsolescence of a proprietary system like Blackboard. Quite the opposite: Sakai’s open platform and community provide an ideal use case for technologies like OpenSocial that cut across systems, opening up, rather than closing down possibilities for integration and creative use. I thank George for the inspiring tweet and thoughtful list. It helped me turn concern into even greater assurance that Sakai 3 is headed in the right direction. Today we learned from RWW’s Marshal Kirkpatrick that the US federal government is considering the adoption of OpenID and other related open identity technologoies and practices for citizen identification on government websites. This is big news for several reasons. First, by adopting OpenID, the governement would be putting the ownership and control of digital identity exactly where it should be: with the citizen. Second, a very large and conservative player—the US federal government—is taking OpenID seriously, which will do much to support OpenID’s continued adoption and evolution. Third, the government will work to establish criteria for OpenID provision that may help us all select credible and worthy identity providers. I’m sure there are more implications as well that will start to surface as government support for OpenID becomes better defined. Also today, we were able to learn more about this big news with the simultaneous launch of a newly redesigned OpenID Foundation (OIDF) website, a joint project with many collaborators including folks from Portland’s own Cloud Four, Janrain, and Richardson Consulting. as well as OIDF board members and executive director Don Thibeau. The new OIDF website is a substantially improved on many different levels, from basic usability, to the breadth and depth of information it already delivers and promises to provide going forward. The new site design does a good job with the difficult task of meeting the different needs of diverse audiences, including the OpenID community, developers, government, and most importantly, individuals who are seeking to learn more about and start using OpenID. Average users should find the site much more useful than the old one, and yet there is at least one area where I think it could be improved sooner rather than later. In a single page, the site tries to introduce users to the wide range of OpenID providers, including all the existing websites and services that provide de facto OpenIDs for their users. 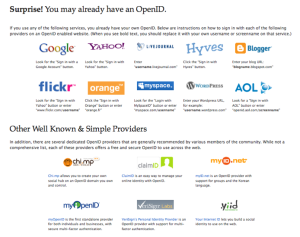 What this page does not do is give people a simple framework for thinking about how to choose an OpenID provider, or why to use one of their existing OpenIDs rather than establishing a new one. As it is, this page provides a richer version of what others have described as the NASCAR effect: a bunch of logos, without a lot of direction about why we might pick one over the other. 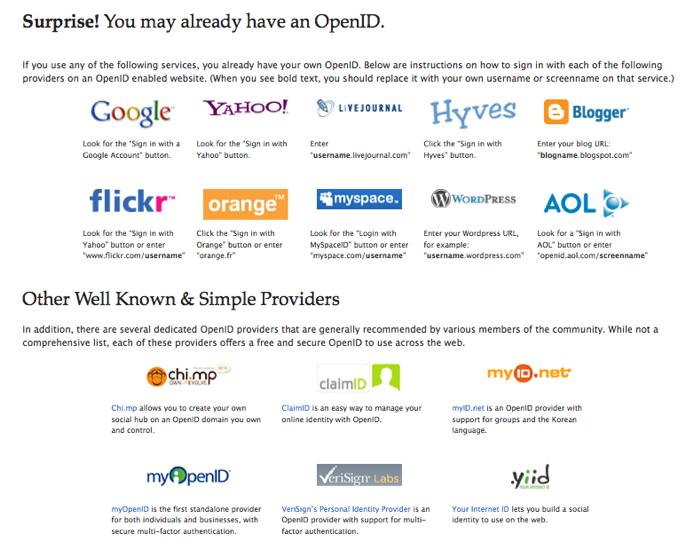 I realize the OIDF must remain neutral about the different OpenID providers, but there is no better entity to provide uesrs with a guide to selecting and using an OpenID. I’m also especially happy to see a new interview with OIDF ED Don Thibeau by board member Chris Messina posted on the new site, which goes a long way to answering my earlier call for more information about what the OIDF has been up to since Don took the helm earlier this year. And while I applaud the new site—it was obviously a lot of work, done well in a short time by some really dedicated people who will probably get less praise and credit than they deserve—I can’t shake the same nagging desire for a different paradigm of communication from the OIDF that prompted my earlier post. The new site could be the best design ever, but unless a new engine of communication stands behind it, it is likely to end up becoming little different than its predecessor, which lay mostly fallow for months. Someone wiser than I explained that the OIDF will never become the communication engine I’m hoping for because of its nature as a standards setting body. That may well be the case, but it will be a significant failure in my eyes if the OIDF falls into that brittle mould. I believe the “open” in “OpenID” should fulfill its promise, leading us to remagine and rearticulate the OIDF’s purpose as something more than a machine to hash out standards for widget inputs and outputs. It is a key organization leading the way in the fundamental paradigm shift to a user-centric web. Now that the large beast of the US federal government is slouching toward the right goal, it is even more important that the OIDF become not just an open standards body, but an open standards bearer, alive, vibrant, leading the way. Or do we have to form yet another open web organization to stimulate, educate, advocate for and communicate with the broadest communities who will benefit from these increasingly successful, open standards? I hope not. Aren’t we all getting spread a little thin as it is?